Queensland Art Gallery (QAG) and Gallery of Modern Art (GOMA), are two very different art galleries. QAG is classical and Goma is contemporary, but they are both operated by the same governing body, confusing called Queensland Art Gallery. QAG has a long history, but when GOMA arrived in the scene in 2006, it greatly overshadowed the traditional gallery and made QAG an outmoded relic. The challenge was to reposition two galleries as a single QAGOMA brand for the first time in order to balance out attendance figures across both galleries. Inspired by the idea of Yin and Yang, we created a strikingly simple visual and verbal system that pulls the two brands together whilst simultaneously celebrating their differences. Identifying a unique situation, we treated QAG and GOMA as two siblings with distinct personalities, rather than two separate galleries or buildings. 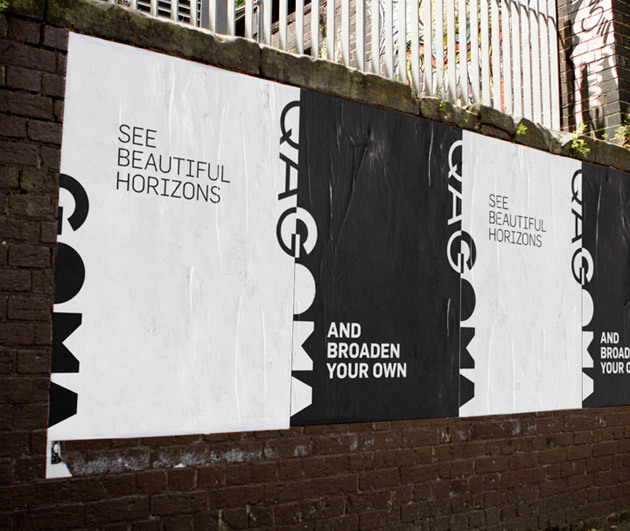 By thinking of QAG and GOMA in this way, we can create a fascinating brand experience that revolves around the conversation and interplay between the two, giving visitors a more rounded and unique experience. Language played a major part in the concept and the execution. No matter which gallery the visitor is in, the other can provide a point of view. The identity system is designed to accentuate the different perspectives each provides by folding around corners, up steps or by splitting in half across surfaces. The new brand will be rolled out gradually over the next six months with restaurants and cafes the first to take on the new identity.